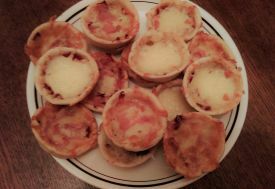 Mini Pizza Muffins – Create, Make & Bake! These are perfect for little kids to make, virtually no effort needed! 1. Roll out the dough on a floured surface to 1cm thick. Cut out circles to fit in a deep cake tray. Grease the tray with butter, and put the cut-out circles in them. Pre heat oven the gas mark 4/180*C/350*F.
2. Put a sprinkle of cheese on the bottom, then a tsp of sauce. Add more cheese and some ham. Bake for 25 minutes or until the pastry is cooked and the cheese is slightly bubbling. Done, easy isn’t it?